Why ambient? A math teaching style that’s whole and all encompassing, with themes that repeat many times through the years, is most likely to be effective and successful. Today’s post will focus on the introductory overview for Grade 1. Note that the Common Core Standards will appear in blue, followed by an ambient translation. In Grade 1, instructional time should focus on four critical areas: (1) developing understanding of addition and subtraction within 20; (2) developing understanding of whole number relationship and place value, including grouping of tens and ones; (3) developing understanding of linear measurement and measuring lengths as iterating length units; and (4) reasoning about attributes of, and composing and decomposing geometric shapes. In my Catholic school Grade 1 picture, I am one of sixty(!) students. There are twenty seven boys standing around the perimeter in white shirts and ties, and thirty three girls seated at desks in white puffed sleeve, peter pan collar blouses and pleated navy blue jumpers. It was orderly! It had to be with one little nun in charge. I learned a lot from the good sisters, up though Grade 12, but I did not ever learn to love (or even like) math. Math and movement must go together, especially in the early grades. Math wants to sing and dance and play, and it is in this context that I will strive to “ambientify” it. In this blog, all posts up through Grade 4 will be close in content and style to the Math By Hand curriculum, which is mainly Waldorf-inspired (along with other alternative approaches). Some major differences distinguish Waldorf from mainstream education, such as: (1) simple, one-digit multiplication and division are taught alongside addition and subtraction; (2) place value waits until Grade 2; (3) formal time and measurement does not appear until Grade 3; (4) geometric shapes are not directly addressed but are thoroughly covered with form drawing. (1) Students develop strategies for adding and subtracting whole numbers based on their prior work with small numbers. 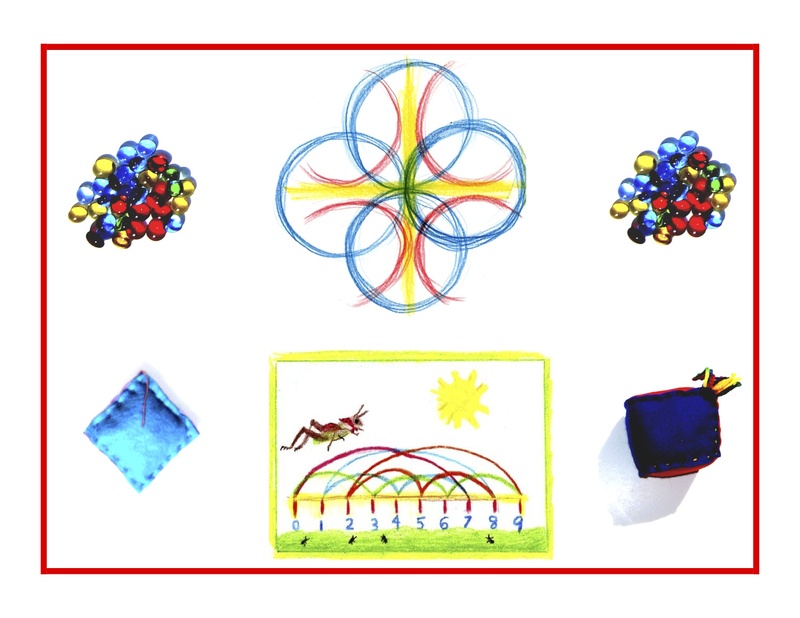 They use a variety of models, including discrete objects and length-based models (e.g., cubes connected to form lengths), to model add-to, take-from, put-together, take-apart, and compare situations to develop meaning for the operations of addition and subtraction, and to develop strategies to solve arithmetic problems with these operations. Students understand connections between counting and addition and subtraction (e.g., adding two is the same as counting on two). They use properties of addition to add whole numbers and to create and use increasingly sophisticated strategies based on these properties (e.g., “making tens”) to solve addition and subtraction problems within 20. By comparing a variety of solution strategies, children build their understanding of the relationship between addition and subtraction. Discrete objects are good tools for learning how to count and calculate, but if the objects used are natural rather than man-made, they can better serve more than one purpose. Cute, colorful, plastic teddy bear counters serve the purpose but may also be distracting. And any opportunity to connect children back to nature should be taken, because “nature deficit disorder” is real, and troubling. Re plastic connecting cubes, yes these and other materials like them are widely used by many innovative math programs, including Montessori. But their use may abstract something that perhaps should not be abstracted: the depth and dimensionality of number and math. So if their purpose is to impart meaning to math functions, meaning may be more likely to be met with Waldorf methods such as attributing different personalities to each of the 4 processes. Increasingly sophisticated strategies such as “making tens” may be too cumbersome and clumsy for now. I saw examples of this online (i.e., finding the total of 8 + 6 by making ten trades to arrive at the answer using 10 + 4 instead), and found it to be a circuitous method, frustrating for both children and their parents. Children crying over hours of homework, and parents wringing their hands over not understanding the method themselves, does not make a pretty picture. Comparing a variety of solution strategies may happen in a more integrated way as the deeper relationships between the processes are understood. (2) Students develop, discuss, and use efficient, accurate, and generalizable methods to add within 100 and subtract multiples of 10. They compare whole numbers (at least to 100) to develop understanding of and solve problems involving their relative sizes, they think of whole numbers between 10 and 100 in terms of tens and ones (especially recognizing the numbers 11 to 19 as composed of a ten and some ones). Through activities that build number sense, they understand the order of the counting numbers and their relative magnitudes. Again, multiplication and division are added into the mix along with addition and subtraction, so that a working relationship involving equivalency and proofs may be in place from the very beginning. The concepts of “greater / less-than” can be learned in a concrete, pictorial way, as can counting the teens to 20, or the differences between the cardinal and ordinal numbers. (3) Students develop an understanding of the meaning and processes of measurement, including underlying concepts such as iterating (the mental activity of building up the length of an object with equal-sized units) and the transitivity principle for indirect measurement. (It’s footnoted that, “Students should apply the principle of transitivity of measurement to make indirect comparisons, but they need not use this technical term.” (Whew! I’d better hone my understanding of it as well . . .)Though measurement and time will not be formally introduced until Grade 3, a solid foundation will be built in Grade 1 with various experiences and activities. (4) Students compose and decompose plane or solid figures (e.g., put two triangles together to make a quadrilateral) and build understanding of part-whole relationships as well as the properties of the original and composite shapes. As they combine shapes, they recognize them from different perspectives and orientations, describe their geometric attributes, and determine how they are alike and different, to develop the background for measurement and for initial understandings of properties such as congruence and symmetry. Geometry is not made conscious and executed with instruments until Grade 6 in the Waldorf method. But the foundations are laid, strong and deep, with form drawing. Starting with a month of main lessons in Grade 1, and continuing once a week from Grades 1 – 5, forms are explored and compared in every possible combination and relationship. True knowledge ensues in an environment dedicated to imaginative, creative knowing, where student and teacher alike surrender to the ensuing of that knowledge as a worthy goal. On to Grade 1 tomorrow!